These may be used with wood-burning appliances. Wood stoves, central heating furnaces, and select factory-built fireplaces usually must use a specialized, high temperature metal chimney. Your local fireplace or furnace retailer can show you the differences between the various types, and which one you will need to use for your installation. All factory-built chimneys must have the proper cap installed to prevent water from leaking into the insulation and to provide reliable draft. In addition to helping ensure critters don’t gain access to your chimney or fireplace. Make sure that your masonry chimney has been built according to the rules found in building codes and can be used with wood-burning appliances. These chimneys normally consist of a clay tile liner surrounded by brick or stone. 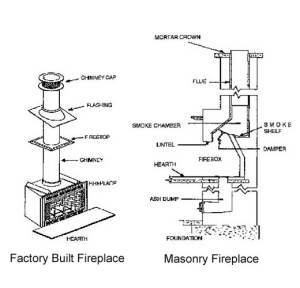 If you are planning to have a masonry chimney built, be sure to get a building permit and make it clear to the mason who will do the work, that you want it to conform to the building code rules. Some simple shopping around for a reliable contractor can go a long way when it comes to expense as well as properly done work. A conventional masonry chimney consists of clay tile liners surrounded by a brick, block or stone structure. Stainless steel liners can also be installed in masonry chimneys during construction, or to correct internal damage in an existing chimney. Existing masonry/brick chimneys should only be inspected by a qualified chimney sweep before a wood-burning appliance is connected. Due to the fact that a conventional masonry chimney has no insulation and functions as a heat sink that soaks up flue gas heat, it is advisable to install a stainless steel chimney liner before using it to vent a wood heating appliance/fireplace. If you have a masonry chimney that you want checked, hire a qualified CSIA certified chimney sweep to inspect it. If you see any deterioration of the bricks or mortar joints near the top of the chimney, or if there are dark stains on the brick work, you should have the chimney inspected immediately! Masonry chimneys that have been damaged by old age or a chimney fire, or are too large for the appliance you want to connect, can be relined with a certified stainless steel liner. These liners can be of either rigid or flex design.